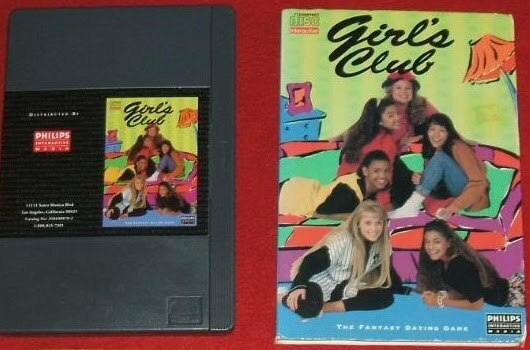 Girl's Club for the Phillips CD-i is a mini-game FMV "adventure" that can be played with up to 4 players. Players take control of a girl of their choosing as they engage in different mini-games centered around finding their dream guy. These mini-games involve dressing up your dream guy, playing with cootie catchers, and many other "girly" things. There really isn't much gameplay to this "game" and it definitely isn't a hidden gem among CD-i games. Now you can add videos, screenshots, or other images (cover scans, disc scans, etc.) for Girls (CD-i) to Emuparadise. Do it now! If you haven't noticed yet, we have a retro game of the day feature (top-right of the screen) wherein we feature a new retro title every single day! Now, you can vote for your favorite games and allow them to have their moment of glory. Click on the button below to nominate Girls (CD-i) for Retro Game of the Day.